The Avro Vulcan was arguably the most advanced of the three RAF nuclear strategic bomber designs of Great Briton's V bomber force introduced during the cold war, it was also the last to remain operational as a bomber being retired in March 1984, the Vickers Valiants had been retired in 1965 due to fractures in it's airframe (due to low flying use it was never designed for!) and the Handley Page Victors long since having been converted into in-flight fuel tankers. Design of the Avro Vulcan nuclear strategic bomber began in 1947 by a team lead by Roy Chadwick of Lancaster fame to meet Air Ministry specification B.35/46 for a bomber able to deliver Britain's nuclear gravity bombs to strategic targets within the Soviet Union, the Avro Vulcan was a controversial delta wing tailless design incorporating four Bristol Olympus engines which served as the basis for the Olympus 320 developed for the TSR2, and eventually modified to power the Concorde supersonic airliner. The prototype Vulcan first flew in August 1952 and the first production version, the Avro Vulcan B.1, entered RAF service in September 1956. The Avro Vulcan B.2 was introduced in 1960, it featured more powerful engines, a larger re-designed wing and electronic countermeasures (ECM), some were later modified to carry the Blue Steel rocket-propelled 1.1 megaton nuclear stand-off missile in place of a nuclear gravity bomb. Blue Steel was a British designed air-launched, rocket-propelled nuclear stand-off missile designed to be carried by the Avro Vulcan Strategic bomber. Blue Steel's nuclear warhead was the Red Snow 1.1 MT thermonuclear warhead from the RAF's existing Yellow-Sun Atomic Gravity Bomb. Blue Steel was Great Britain's primary nuclear deterrent from from 1963 to 1970 when it was superseded by the introduction of the Polaris submarine-launched ballistic missile system. The RAF's V-force, especially the Vulcan, was the backbone of the United Kingdom’s nuclear deterrent throughout much of the Cold War and represented a significant stabilising influence in October 1962 during the Cuban Missile Crisis, at this time WW3 was a definite possibility. If if the worst had happened, and WW3 had started in 1962, RAF Vulcan B2's would have been the first Western Nuclear equipped bombers to enter Soviet airspace, at least an hour before the American Boeing B52's which were constantly on station in the air two hours flying time from their designated Soviet targets. The Soviet leadership were fully aware of these facts at this time and it would have been seen as an significant reason to avoid the risk of escalation into a Nuclear War. "The Spirit of Great Britain"
The RAF's Vulcan bombers only ever made operational bombing sorties during 1982 in "Operation Black Buck", Avro Vulcan B.2 aircraft, armed with conventional bombs and Shrike anti-radar missiles, flew 3890 miles (6,260 km) from Ascension Island to Stanley during the Falklands conflict to attack the airfield's runways, they were re-fuelled by Handley Page Victor F2 tankers on numerous occasions. 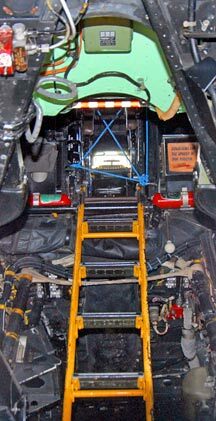 As the Vulcan was reaching the end of it's operational life the remaining aircraft were in relatively poor condition, in over a decade, since their relegation to a normal bomber role, they had not had to use their refuelling probes in and it was necessary to remove one one from a museum aircraft in order to make enough aircraft operational to successfully complete "Operation Black Buck". The introduction of the Royal Navy's Polaris submarines in 1970 as the new British nuclear deterrent resulted in the Vulcan being relegated to a conventional non-nuclear bomber, a role in which they were to remain in until the mighty Vulcan was withdrawn from RAF service in March 1984. On the 18th of October 2007 Vulcan to the Sky Trust's restored Vulcan B2 XH558, the ex RAF Vulcan air show demonstrator aircraft, once again took to the sky allowing the totally unique "Vulcan howl" from it's four mighty Olympus engines to be heard once again in British sky's. It is of note that a number of Avro 707 series aircraft were built to help with the development of the Vulcan bomber's tailless delta design, and also act as stop-gap trainers to help convert pilots to the delta wing configuration used on the Vulcan bomber. These pictures of a Avro Vulcan B.2 are Copyright © airpowerworld.info 2010. We only authorise non-commercial picture use but particularly encourage their use for educational purposes. These Avro Vulcan B.2 pictures are not in the Public Domain. 3) Use of this Avro Vulcan B.2 picture, or any of our pictures on websites re-distributing copyright free material is strictly prohibited.